Our range of products include mycept tablet, mycept 500mg and mycept s 360. 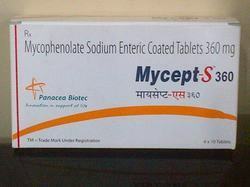 Mycept S 360 or Mycophenolate Sodium Tablet, which is one of the important transplant tablets. These tablets are widely recommended by medical practitioners for their accurate composition. Moreover, Mycophenolate Sodium Tablets are used to cure various kinds of disorders and diseases with excellence. These tablets are also considered ideal for increasing immunity power and improving health. 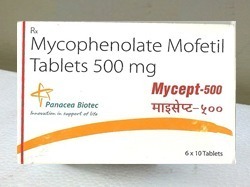 Mycofit-S Drug name : Mycophenolic Acid Strength : 360mg Packing : Pack of 10 Tablets Backed by hi-tech labs and vast industry experience, we are engaged in offering highly effective Mycofit-S Tablet which is used to prevent rejection in organ transplantation, the offered medicines are tested from our end in order to deliver a quality assured range from our end. These medicines are formulated with the mixture of ingredients as per the set standards of medical sector. We provide these medicines in various quantities as per the prescription. Looking for Immune System Medicine ?